Who doesn’t love baby chicks in the spring?! 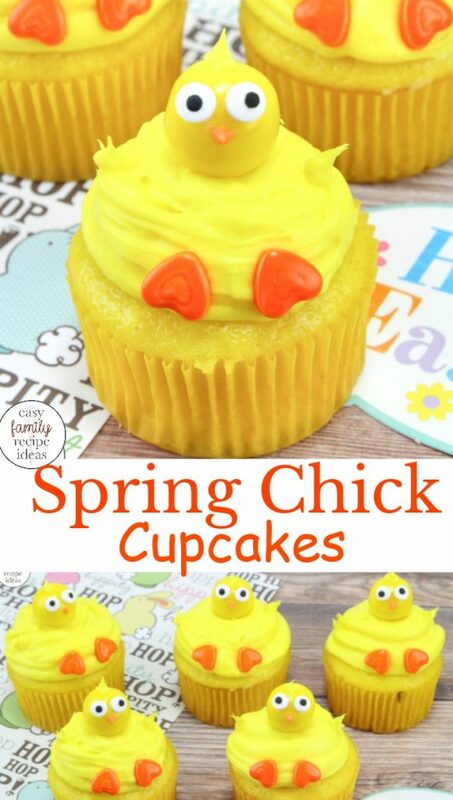 This week while making our meal plan I knew I wanted to include a spring cupcake for the kids and their friends. 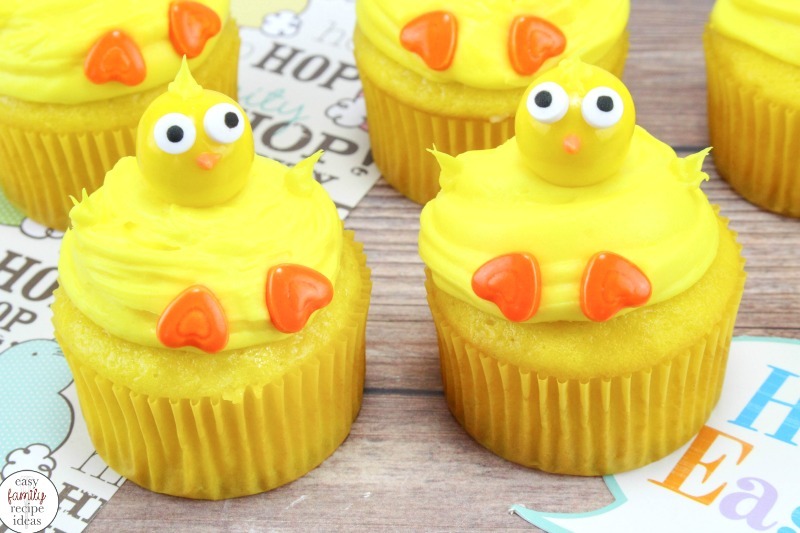 And these adorable Baby Chick Cupcakes were a perfect idea. 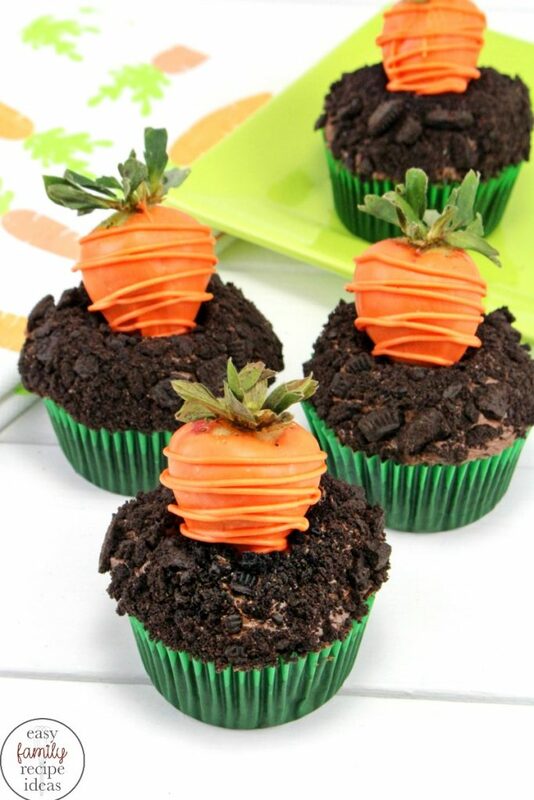 Spring has to be the best time for cute cupcake ideas and farm animal desserts. 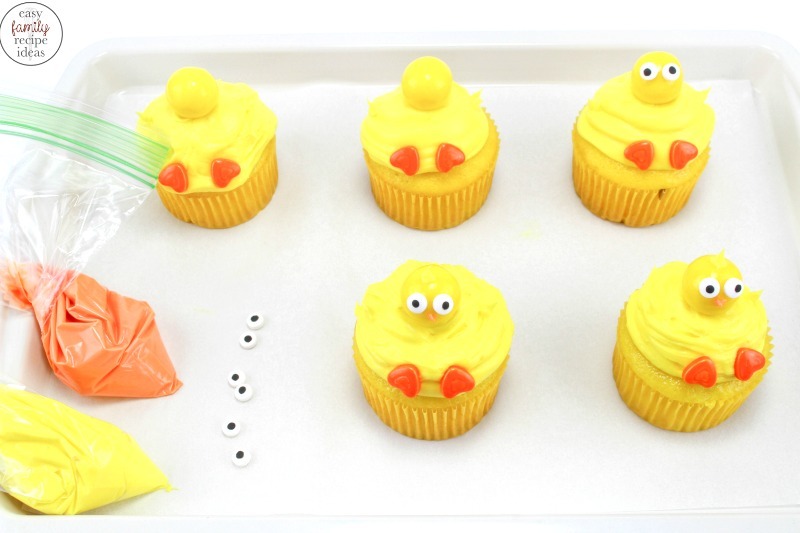 The children loved these cupcakes, and they were so easy to make, starting with your favorite boxed cake mix. 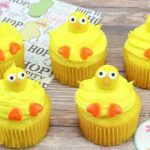 If you’re looking for a quick and easy cupcake that you can serve to your family and friends for Easter or a spring picnic, these cute Easter Chick Cupcakes are a fun idea. 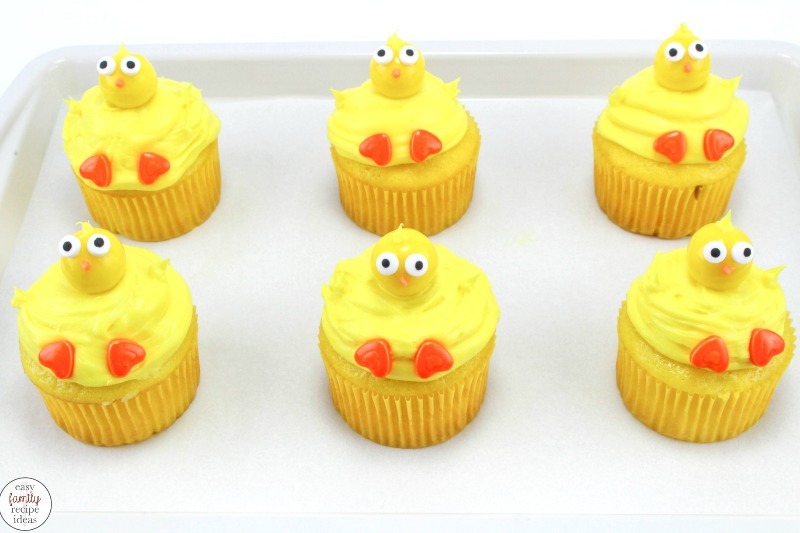 What you will need to make these Easter Chick Cupcakes is in this picture below. 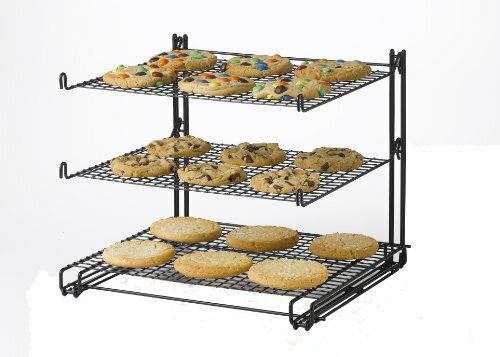 However, I have it displayed in a recipe list form to print out towards the bottom of the page. 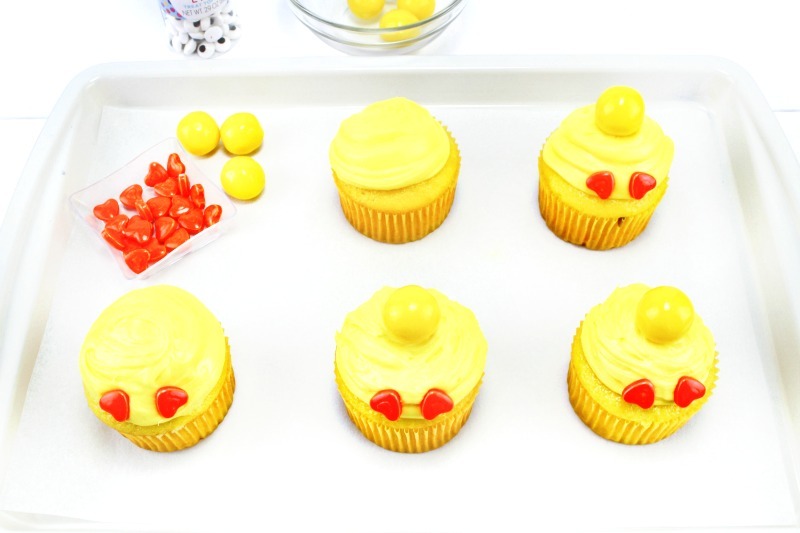 To make the yellow cupcakes… Just use a regular white cake mix and add 7-8 drops of yellow food coloring to the mixture. 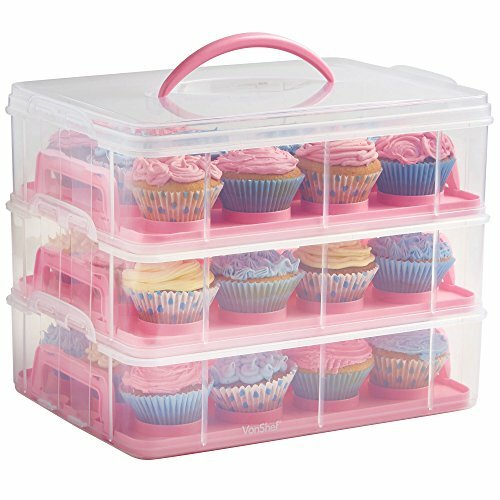 Then pour into cupcake liners and bake according to box cake package directions. 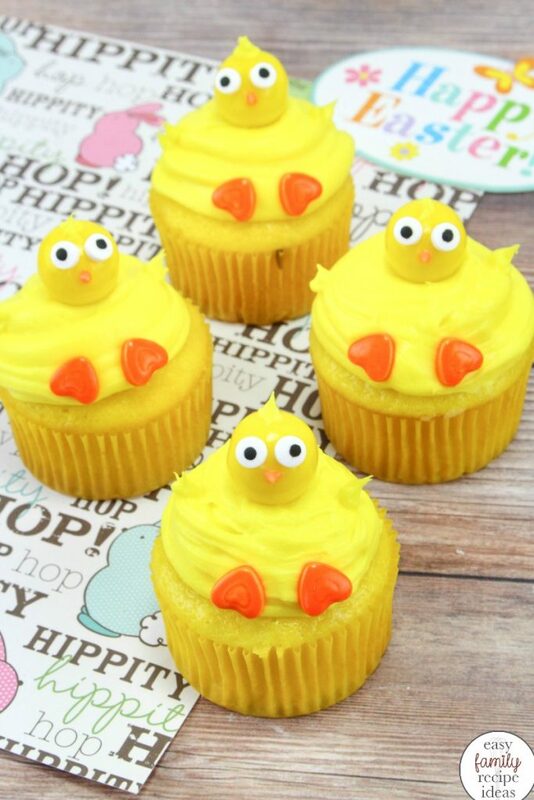 Yellow cupcakes would be best for a baby chick theme. 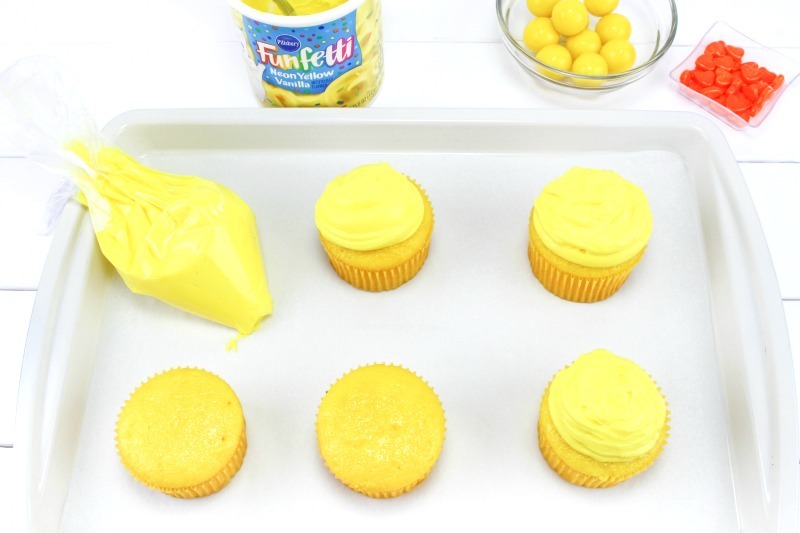 Frost your cupcakes with the Funfetti Neon yellow frosting or add a couple of drops of yellow food coloring to white icing and then frost. Place 2 orange heart candy towards the bottom of the cupcake to represent the feet. Then place a gumball in the center of the cupcake. 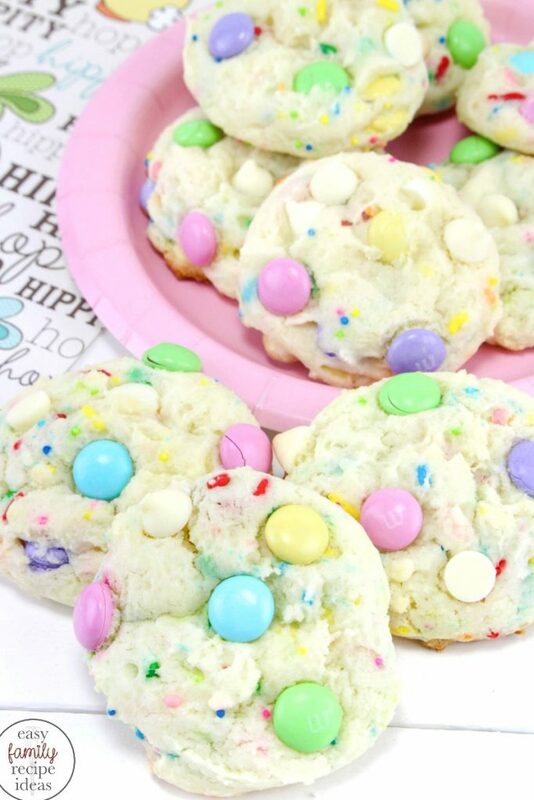 Add a dot of frosting to the back of each eye and place on the gumball — repeat step with the remaining cupcakes. 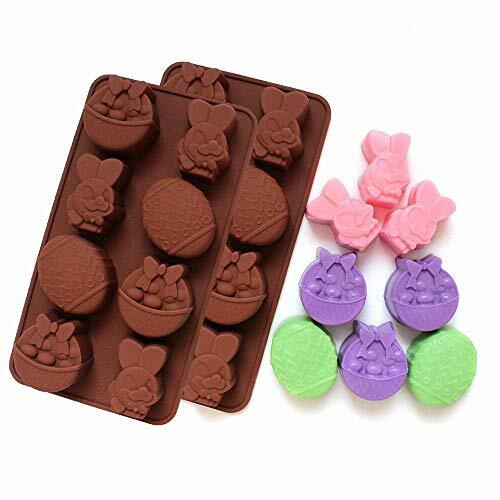 Melt the orange chocolate discs according to package directions and place them in a sandwich size baggie and snip the corner just a tiny bit. Pipe on a little beak underneath the eyes and let them dry. 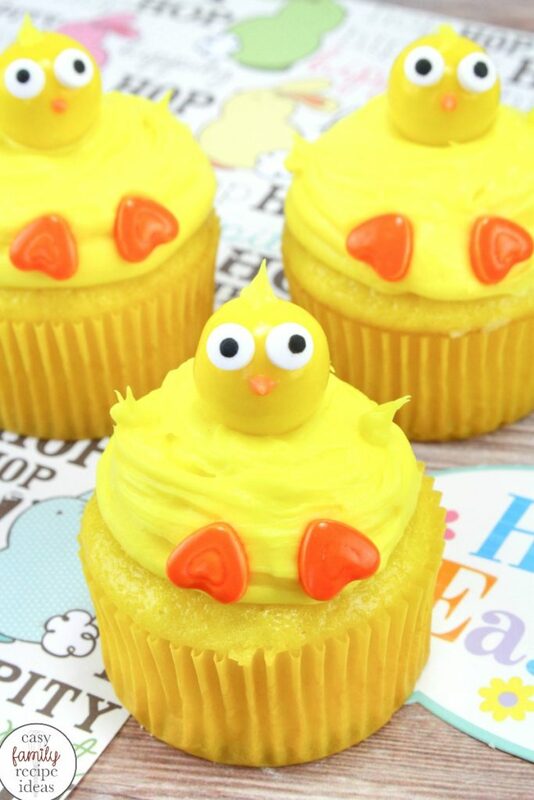 Enjoy these fun Cupcakes for Easter or anytime of the year! 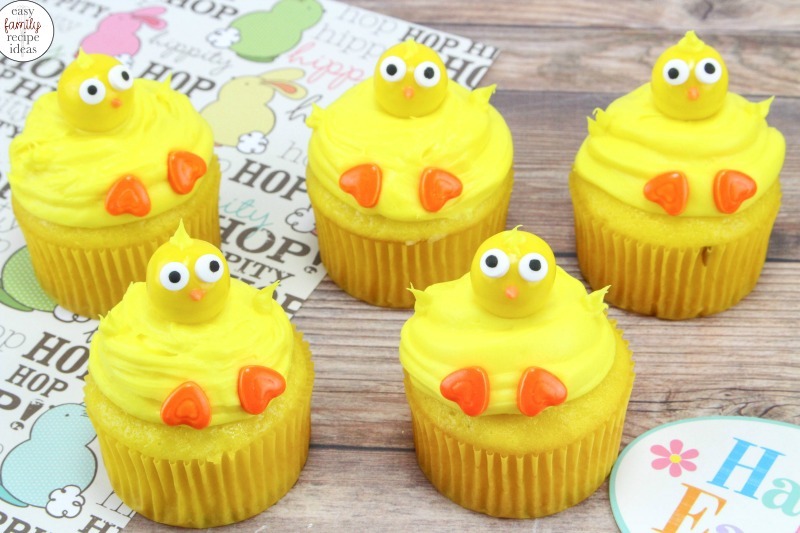 My daughter loves baking with me, and these cute baby chick cupcakes and Easter desserts are perfect recipes that your children can help with. 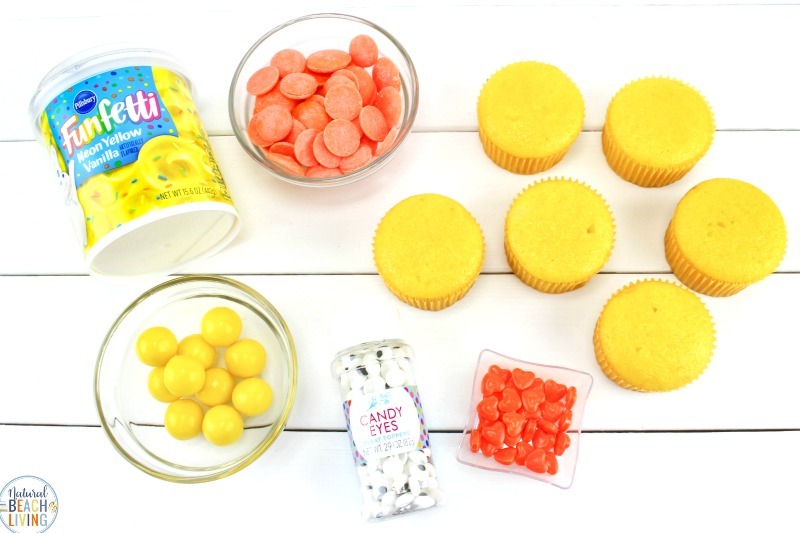 To make the yellow cupcakes… Just use a regular white cake mix and add 7-8 drops of yellow food coloring to the mixture. Then pour into cupcake liners and bake according to package directions. 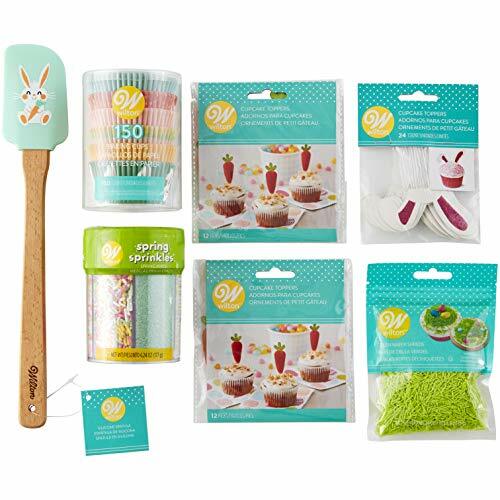 Add frosting to a piping bag or quart size baggie. Snip Corner and pipe frosting in a circular pattern on each cupcake. This will represent the body of the chick. Melt the orange chocolate discs according to package directions. Place in a sandwich size baggie and snip the corner just a tiny bit. Pipe on a little beak underneath the eyes. Let dry.